Today my good friend Gary Michuta, Catholic Defender extraordinaire, came out to visit today with a priest from Magadan Siberia in Russia. He has served there for seventeen years. Fr. Michael Shields serves in the Church of the Nativity in Siberia. The church is located in Magadan which is known as the “Russian Auschwitz”, the heart of the Soviet Union’s Gulag Archipelago which was graphically described in the works of Alexandr Solzehitsyn. Hope you enjoy the short video of his time with us — and a little about the area where he is ministering. He has tentatively invited me to come to Russia, namely Siberia, to do a series of talks. I will gladly go! These attacks are distant from any sites we visit on pilgrimage. Not to be dismissive, but the attacks came in an area near Eilat which is well over 300 miles south of Jerusalem at the Egyptian border. First, this is no where near Galilee or Jerusalem. It is hundreds of miles from our pilgrimage sites. 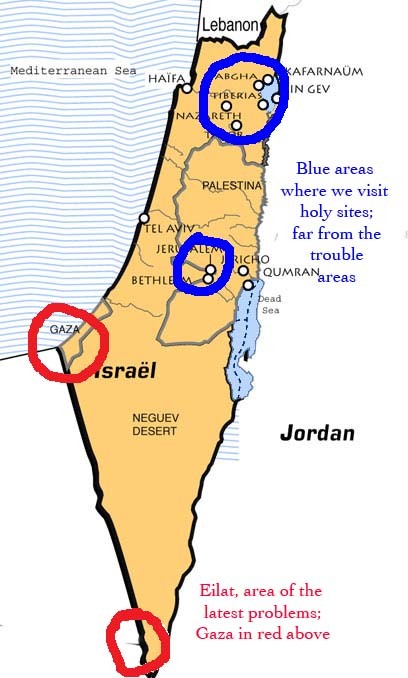 We never go near Gaza or the Egyptian border (see red circles). Second, Israel will be on high alert in the weeks and months ahead which minimizes the possibility of future attacks. Third, there are 10’s of thousands of tourists there now safely enjoying the Holy Land, which includes a huge group going over with Glenn Beck this month. Fourth, if people allow these random attacks in outlying areas to keep them from visiting the Holy Land – remember that many in Europe and Israel are afraid to visit America due to the sensational news reports of murderous attacks and problems in our country. Fifth, over 3 million people visited Israel last year and more than 3 million are visiting during 2011. No tourist has ever been harmed. The target was public transportation (which we never use) aimed at Jews, not international tourists visiting holy sites. Sixth, we’ve been to the Holy Land over 100 times in the last fifteen years, leading thousands of people, including three trips already this year. You can trust us and our experience. Seventh, if there ever were problems in areas near us we would act immediately to be out of harm’s way, but it has never happened. We have two trips in October. Both are moving ahead without disruption. The first trip is fully booked, and only a few seats left for the October 27 group. If interested, visit www.SteveGoes.com.